Have you ever thought about creating a blog post just for close friends or family members? Or publish a post just for editors on your WordPress site? As a content publishing platform, WordPress comes with some basic content visibility options that most beginners overlook. In this article, we will show you how to create a password protected page or post in WordPress. 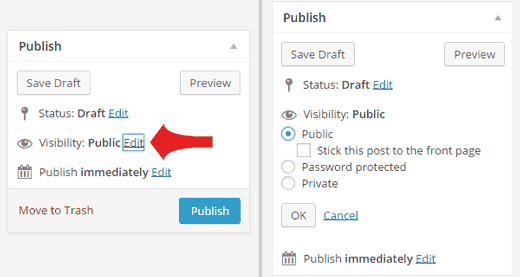 A private post in WordPress is visible only to logged in users with the Editor or Administrator level user role in WordPress. The same trick works for password protecting a page in WordPress as well. All your password protected posts may appear among rest of your posts on the homepage, or archives of your site. If you want to hide them completely, then use this code in your theme’s functions.php or in a site-specific plugin. That’s all. Your protected posts will not appear in the site’s homepage or archives. You can send the post’s URL to users with the password. 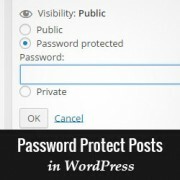 We hope this article helped you password protect posts in WordPress. You may also want to check out how to make a whole WordPress site password protected without user registration. I have set the Blog page to password protected. The site is juliananoreen.com. It still is visible! Had a friend test from a cell phone. Visible there too. Is there an additional setting that I am overlooking? I am expecting to see a message and password section but the test posts are completely visible. The blog page is a place holder to display your WordPress blog posts. Unlike regular WordPress pages which show page content, this page shows your blog posts list. Normally, the WordPress password protect feature works on the content of a post or page. However, a blog page has no content of its own. This is why before the password protection can kick in, the blog posts get displayed. Have any ideas how to fully lock it down so I can add content and all elements are hidden? I did initially try password protecting the posts – not an option b/c the title and feature images are still visible. Hmmmmm….? I saw that you can set the post_password_expires to 0 but where would I do it for a page? My password protection is not working. It keeps referring back to the password prompt. Yes i have the correct password. Any ideas? I made sometime ago a Password protected post, but I can’t remember the password. If I dont know the password, how to read a protected post? Is there a way to change the default text to these password protected pages? I would like to leave a link in this text if it’s possible? I have pages not posts that are password protected. Being pages i have no issue with them showing up in archives etc. I have them on my menu. I want only the main page not any of its children to show up in my custom menu until the user logs in. Is that possible? Does that code work where it is not technically a “user” it is entering the password for a protected page? Anyone can do that, they do not need to be registered as a user. the default WP expiry of the login is 10 days!! That is not much use on a private computer. I found if I used this plugin ‘Protected Posts Logout Button’ and added the logout button to every page with the password it logged out of all of them when I clicked one. It also allows setting auto logout time/cookie expiry. So I set 30 minutes in case a user does not logout. Static page – I set visibility to “password” and set a password. Worked a treat for a few weeks. In the last couple of days when entering password page results to “Forbidden”. Password is correct. have disabled Plugins, activated default themes and still same result – cannot access password protected content. Is this a server host issue or WP issue? I tried this and find the following error: when someone wants to use it, they fill in the password (on a page) and they are redirected to the captcha and directed to my wordpress login in. That should not be the case? I do not understand this. this was working great until a recent update now I just get a 404 page.. Try updating your permalinks. Simply go to Settings > Permalinks and click on the save changes button. Yes, first thing I did, was surprised when that didn’t fix it. We tested the code again with the latest version. It worked fine on our end. Have you tried troubleshooting steps like deactivating all plugins, switching to default theme, deleting and regenerating .htaccess file? Hi, interesting – I’ve never seen this before (I don’t think!). …Will this be bad for SEO purposes? Can search engines still crunch the content? So this was pretty cool – it protects the page. I enter the correct password, and the page shows up fine. Now, when I Refresh the page, it still shows up. When does the password prompt come up again? I am unable to access the private blog from my iphone as it only allows me to type the password in capital letters, yet my password is all lowercase. Also any text entry like subscribe box is all in caps too. how can I resolve this apart from changing the password to all caps. I think it’s a great feature. How can I open the password protected Page with a Query String? So I can send a Link to my friends. Thanks for any ideas. i added a link in my site and i want that whenever anybody click on in there then by Clicking this link will bring up a password prompt, if user successfully enters password they are allowed to access a password-protected page. This works great EXCEPT the post is still showing up in the “Latest Posts” widget. Any code change to fix that? is there any way to make it available to logged in users. By default even a logged in admin cannot see this password protected post. Is there any way we can make it available to all logged in users?